The Witch Wreath donated to the University of Pennsylvania museum. 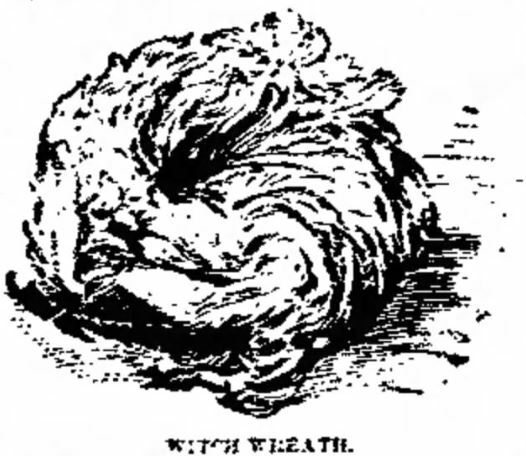 A recent discovery of a “witch bottle,” reminded me of one of the most bewitching of witch artifacts: the “witch wreath” or the “crown of feathers.” Found inside beds and pillows, these circlets of feathers appear most often in Appalachian and German folklore, both as an omen of death or bewitchment and also as a token of salvation, something which I suspect is a later belief grafted onto an essentially malevolent sign. The surviving specimens I have seen have been made of white or grey-shaded feathers, but there are many references to bright and even gaudy colored plumage, which makes one wonder about the source–was someone plucking the pet parrot? Let us wing our way through a couple of accounts of feather wreaths. We will look first at the alleged history of a “witch wreath” donated to the University of Pennsylvania’s museum. A remarkable object illustrating a popular survival of the belief in witchcraft has just been presented to the Museum of the University of Pennsylvania by Prof. William Romaine Newbold. It consists of a matted ring of chicken feathers, about three inches in diameter, described as a “witch wreath.” It was secured by Dr. George B. Kline, of Pittsburg, who gave it to Dr. Newbold, who transferred it to the museum. A resident of Pittsburg, who had been ill for several years, died in July, 1897. During his last illness, extending over several months, he would frequently throw his pillow away, saying: “There is something in that pillow that hurts my head.” His wife said that this was impossible, as she had gathered the feathers and made the pillow herself a few years ago. Some days after her husband’s death the widow claimed that something seemed to say to her, “Look at the pillow.” Upon opening the pillow she found this object within it. When questioned closely she declared that the sewing was hers, and that it showed no signs of having been tampered with. The neighbors believe in the woman’s truthfulness. Her husband had been an old soldier. He frequently took a cup of coffee at the house of Mrs. S., and was invariably more ill after doing so. Mrs. S. died a short time before he did. The patient was attended by Dr. George B. Kline and the facts above given are furnished by him. Dr. Kline writes that a similar wreath was found in the pillow of a six-year-old child, who died of the same disease and about the same time as the above mentioned patient. This was burned by the witch doctor without Dr. Kline seeing it, but he is informed that it was precisely like this one. By inquiry, Dr. Kline learned of four or five other families who were said to have found witch wreaths in their pillows, and who ascribed to their presence cases of illness in their families. There is a “witch wreath” still listed, without a photograph, in the University of Pennsylvania’s museum website, but although the donor is W.R. Newbold, its provenance is listed as possibly Southwestern Pueblo culture. I’ve written the museum for more details. Here is a little more about how the wreath was supposed to work. Such things were considered rank superstition by educated and enlightened journalists in the 1880s and 1890s. And even in the 1860s, this next story decries belief in witchcraft, while still acknowledging the existence of witch books and the curious coincidence of the “witch” arriving on cue. The writer also supplies a wholly unconvincing theory of how the wreath got in the feather bed. From the Muscatine (Iowa) Journal, June 18th. A case of remarkable superstition has come to light in this city, which has caused general surprise. It seems that some time since, a German lady, living in an eastern precinct of the city, known as Kecklerville, was taken sick and exhibited some strange symptoms. Physicians were called but could neither define the disease nor afford relief, and it is stated the woman subsisted over two months upon nothing but wine, as no other nourishment would remain upon the stomach, which also refused all medicines administered. A short time since, a spiritual adviser was called, who gave the startling information that in his judgment, the invalid was bewitched, and that if the premises were searched, something could be found that would prove his statement. Accordingly, thorough search was instituted inside the house and out, but without success, until, as a last resort, the feather bed upon which the woman lay, was ripped open. In the center of it was found a wreath of feathers, representing a bouquet of roses. This discovery created quite an excitement in the neighborhood, and among a certain class of believers, suspicion fell upon a lady residing a few doors distant from the scene of mystery. The spiritual adviser was again consulted, and he asserted that the mysterious charm indicated that the person who placed it there was a witch, and that if it were removed from its concealment the witch would enter the house, through the door, in less than five minutes. Curiously enough the very woman who had been suspected as a witch, entered the room simultaneously with the removal of the charm, when she was accused, face to face, with having bewitched the patient. She was then plied with questions by the friends of the sick woman, and, in reply, stated that she had possessed a witch book, some time ago, but had loaned it, that the person supposed to be bewitched had frequently borrowed it, and that if bewitched, it was her own doing. About ten days after this occurrence the woman died. A medical post mortem examination was had, when it was discovered that she died from a cancer in the stomach. She was buried last Saturday. Several stories in the witchcraft chapter of my book, The Headless Horror tell of feather wreaths/witch wreaths, including the complete story of the Cincinnati boy mentioned above. That is quite a bit of randomly matted plumage. Was this an infectious delusion, spread to the superstitious neighbors? Was it (wildly woo-ing here) PK-generated—the feathery equivalent of stigmata. (Temporal lobe is the thing with feathers…) Or perhaps “supernatural” artifacts produced by the woman in a dissociative state and sewn into the bed-tick unawares? I have to say that all the wreaths I’ve seen look like natural formations. Here are some examples from the Museum of Appalachia. Here are several interpretations of the feather crowns. This from Hoosier Folk Legends by Ronald L. Baker. And this from a geneaology forum, about how the crowns grew, even while hidden in a shoe box. Other illustrations or stories of witch wreaths? Plume yourself on your knowledge: Chriswoodyard8 AT gmail.com.